Heat oven to 375°F. Spray 8 muffin cups with cooking spray. 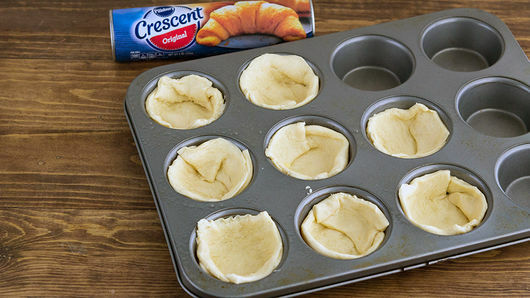 Unroll 1 can (8 oz) Pillsbury™ refrigerated crescent dinner rolls; separate dough into 8 triangles. Place 1 triangle in muffin cup; press in cup to cover bottom and around side. Use scissors to cut off excess dough; use to fill in any spaces to create a seamless muffin cup. Repeat with remaining triangles. In small bowl, beat 6 eggs with whisk. Add salt and pepper to taste. 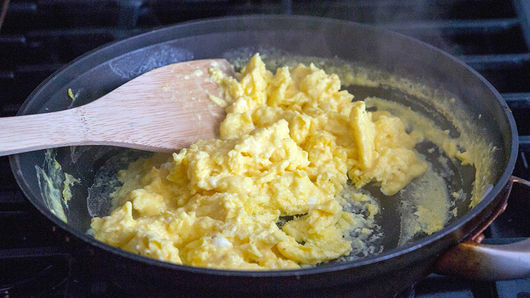 In large skillet, scramble eggs over medium-low heat, stirring constantly, until fluffy and just under done. Eggs should be shiny but not wet (they’ll finish cooking in the oven). 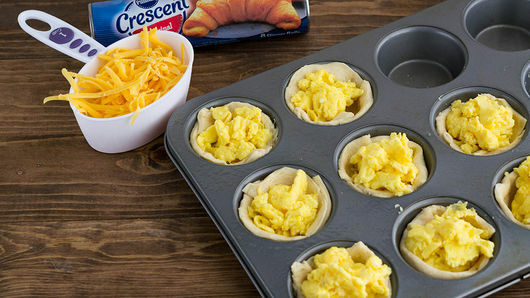 Divide eggs evenly among dough-lined muffin cups. Top each with 1 tablespoon shredded Cheddar cheese. Bake about 10 minutes or until cups are golden brown and cheese is melted. Remove baskets from oven, cool in pan a few minutes. Remove from pan to serving platter. Place bacon “handles” on baskets, pressing ends of bacon into edges of baskets so they stand up. Serve immediately. Flavor your eggs with some salsa or herbs while you’re cooking them for an extra-flavor punch. 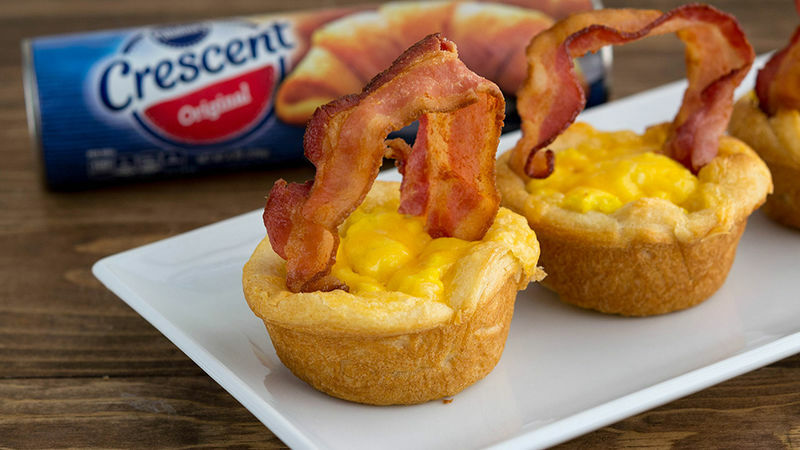 These can be frozen for quick morning breakfasts. Freeze (without bacon) in a single layer on a cookie sheet. Once frozen, place in a gallon-size zipper-topped freezer plastic bag. 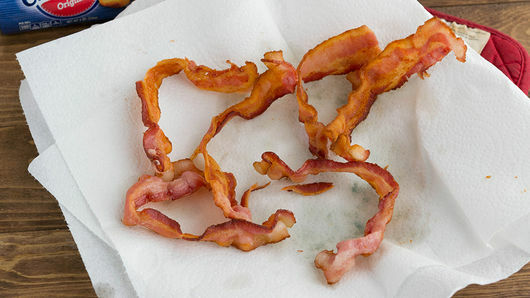 Bacon can be frozen separately. To reheat, microwave basket on High for about 45 to 60 seconds and bacon for about 20 seconds.